Marla Cilley, known to her followers as the FlyLady, is an organizing and time management expert with a system she calls FLYing. 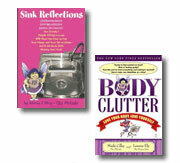 She has published two books, Sink Reflections and Body Clutter: Love Your Body, Love Yourself. The latter spent six weeks on the New York Times bestseller list in 2007. She is the owner of the website FlyLady.net, which helps women take charge of their lives. She is an example of someone who truly lives what she teaches, and reaps the blessings from it. 1.Marla, thanks for offering to do this interview. You are so organized! You’re the first person I’ve interviewed that replied immediately with a specific time to meet. It’s better to reply right away and set up a time so we don’t waste emails. Plus, I’m so happy to be talking to a magazine by women, for women who write. 2.Tell us a little about yourself. I became involved in the political system in 1998. A woman from the Board of Commissioners won a seat on the North Carolina legislature. I was appointed to fill the seat she left vacant in November, and I took office in January 1999. The other four members of the Board were men. My biggest fear when I took office was that those men would find out my dirty little secret: that I couldn’t keep house. 3.Wow, I can relate! As women, I think that’s a common fear. No matter how successful we are, we always worry about our household. I always find it interesting to learn how authors got their start. You have two books out, one called Sink Reflections. Can you tell us a little bit about that? I wrote Sink Reflections in two weeks during July 2001. I self-published it in March 2002, and sold several thousand copies. It made it to the top 100 on Amazon. When that happened, I started getting phone calls from agents and publishers. I chose an agent, and then seventeen publishers bid on it. Since I had the upper hand, I interviewed them and decided whom I wanted to work with. 4.That’s an amazing story. Your other book Body Clutter: Love Your Body, Love Yourself has been on the New York Times bestseller list. Congratulations! Can you tell us about that? Leanne Ely and I co-authored Body Clutter over one and a half years. It was an amazing process, much harder than Sink Reflections, but it came together. We self-published it in October 2005. With no national publicity, it made it onto the New York Times Bestseller List, and stayed there for six weeks. Then we had another bidding process with six publishers and we signed with Simon and Schuster. 5.The FlyLady website is so much fun, and it makes the readers feel good about themselves. Is there a secret to your magic? I just want to help women gain back their freedom. In December 1999, someone asked me for help, and I started the FlyLady mentoring group. By 2004, we had 250,000 members. We hit 500,000 members in August 2008. 6.On your website, you have acronyms and names for many different things, which I love. They make it so easy to remember things. CHAOS, (Can’t Have Anyone Over Syndrome), FLYing, (Finally Loving Yourself), 27-Fling Boogie, etc. How do you come up with these great ideas? They just come to me. I’m creative and I want to make it fun. 7.Are you a natural born organizer? No, no. Women that are born organizers can’t even tell you how they keep things in order, they just do it. I needed a system to help me. 8.How did you get started with the FlyLady program? The same January that I took office, I made a New Year’s resolution to get organized. I started the process using a card file system I had used before, designed by Pam Young and Peggy Jones. I already had a card file tray 18 inches long with over 500 cards, each listing a task to do. You might say I was obsessive compulsive. I began putting cards in daily, weekly, and monthly piles. My daily pile alone was 50 cards. But I found that if I skipped a day, I got behind, and felt guilty. When that happened, I put the cards under the kitchen counter so I wouldn’t have to look at them. The cards became my nagging voice, and I ignored that voice by shoving it under the counter. I tried to figure out why the card system didn’t work for me. I realized I had never established a habit. We’ve all heard that it takes 21 days to make a habit. SHEs, (Sidetracked Home Executives), might need longer than that. I picked one card to practice a new habit for 31 days. That one habit was all I had to do. I started by cleaning my sink. After that, it became contagious. I wanted to empty my dishwasher and clean my countertops. Then it spread to the stove, the floor, and before I knew it, the kitchen was sparkling. It had an uphill snowball effect. Those baby steps manifested in a clean kitchen. 9.So if someone is reading this interview, and they feel hopelessly disorganized or out of control, what is the first thing you suggest they do? Start with one habit and build a routine. Don’t expect to do it all at once. Start small, and let the snowball effect happen. Also, you need to learn to forgive yourself for missing days. Sometimes that’s the hardest part, forgiveness. 10.Your program begins on Day One with the kitchen sink. You tell us to shine our sinks, and you even give step–by-step directions and a video. How does having a shining sink help our self-esteem? When you start, you only have to concentrate on one thing, make one new habit. Once your sink is staying clean, it’s contagious. You don’t want the sink to get dirty again with dishes, so you clean out the dishwasher. Then you want those counters to be clean. Once you get the grime out, you’ll just be maintaining, so it gets faster. As it spreads, you start feeling better and better about yourself and you feel proud of what you’ve accomplished. 11.Once we have our sink under control we can begin FLYing in other areas, is that right? What’s the next step? Next month, add another habit. Establish those habits. Combine all the baby steps, stringing them together like pearls that will glide you through your day. Once you make your string of pearls, the house will practically clean itself. 12.It’s so fun talking with you. Let’s move on to time management. Another hallmark of your program is your timer. How do you tell women to use it? I give women slogans to help get rid of the negativity in our heads. Stop saying, “I can’t do this.” Replace it by saying, “You can do anything for 15 minutes.” Use a timer and set it for 15 minutes. Start a task, and when the timer rings, you’re done with that task. You can even use your favorite music on your iPod, or commercials on the television as timers. When you do this, it’s fun, and you’ll be amazed at what you can do in 15 minutes. 13.You send out daily emails that cover a mission for each day, using the timer. How do you decide which missions to do? The missions are divided into zones. Zone 1 is your front porch, entrance, and dining room. Zone 2 is the kitchen. Zone 3 is the main bathroom and one other room. Zone 4 is the master bedroom, bathroom, and closet. Zone 5 is the living room. We start each month in Zone 1. Then, the first full week is spent in Zone 2. Zone 3 is done the second full week. We continue until you’ve spent one full week in each zone every month. These missions cover the detailed cleaning that we put off, like wiping down fan blades, mopping floors, that type of thing. Then you have a quick daily routine that maintains your house each day. Your daily routine keeps your bathroom clean, and keeps you from finding Mount Washmore in your house. 14.You also have rescue missions for what you call hot spots. These take less than five minutes. Can you tell us about those? I pick them by looking around my house, and you can do the same. A hot spot is any spot where you drop things and the pile builds. You need to police them twice a day. They take less than 5 minutes, so it’s a quick way to keep things put away. 15.So many women today want to do everything perfectly. One of the hallmarks of your program is to not be a perfectionist. Can you explain that for our readers? Perfectionism is a tool to separate us from our family and our dreams. A perfectionist thinks she doesn’t have time to do something right. Things don’t have to be perfect. Once you let go, it can open a door to others and to blessings. Women are givers. We give all the time, so that other people’s cups runneth over, but our cups can get empty. We have to take time to renew our spirits. If we can’t find peace in our own home, we can’t share it with others. You can’t give what you don’t have to give. 16.That’s so true. On your website, you have pampering missions and fun things to do for Friday, Saturday, and Sunday. What are those about? It’s important to have family time. Friday is Date Night, when you spend time with your husband or someone you love. Saturday is Family Fun Day, when you plan a fun activity with your family. Sunday is Renew Your Spirit Day. Weekends should not be for doing housework. It should be time for being together and having fun. If you keep up with your new habits, you’ll have time for all these things. 17.Flylady.net has something for everyone, even the guys. Can you tell us a little bit about your control journals? We have a Home Maintenance Control Journal that is for everyone. I interviewed people and created a methodical way to keep a house maintained. I have a Student Control Journal and a Teacher Journal. The journals help you build habits. When I see a need for something, I fill it. Struggling people who are trying to do everything call me or write me and I want to help them. Christmas can be a time of angst and anger, but the Holiday Control Journal brings peace back to the holidays. The main part is the coming together and loving each other. 18.So many women want to do it all. Yet we constantly hear that we should FOCUS on one thing. What’s your advice? We can’t focus on only one thing. Our personalities don’t allow us to do that, because we get bored. Routines are the framework that helps you follow your dream. They free you up to be able to play. 19.You have a phenomenal success story. You’re on blogtalk radio, you have forums, and you even have a Wikipedia page! Do you have any other projects you’re working on? I write newspaper columns for 250 newspapers around the world. I have a column in Israel and one in Sweden. Two weeks ago, I pulled all my columns together into two new books. We’ll be self-publishing those books, because that’s our model, to self-publish first. We’ll also be publishing a book this fall by a school psychologist that is a friend of mine. It’s about how to empower parents to stand up for their children and not be afraid of the teachers and administrators. I also have a hobby of producing music. Our first CD came out two years ago. This year we’re doing a children’s CD that will reinforce kid’s routines. It has all different genres of music. It has tango, sambas, and 1940s music. We had a ball doing it. 20.Is there anything else you’d like to say to our readers before we end this interview? FLYing will free you up to be who you’re supposed to be. If writing is your passion, you can do it, even if it’s only for 15 minutes. I wrote one book 15 minutes at a time. You can do it, too. Ladies, be sure to stop by The FlyLady website, join the FlyLady Yahoo group, follow FlyLady on Twitter, and listen to her on Blog Talk Radio. You’ll be organized and in control of your time before you know it! Suzanne Pitner is a contributing writer at http://www.Suite101.com and has been published in many webzines, Cat Fancy Magazine, and a local newspaper, The Dixon Tribune. She writes adult fiction under the name Suzanne Lilly, children's fiction under the name of SariAnne Miller, and maintains a blog at http://www.teacherwriter.net.